Mitch and Elizabeth Breitweiser Launch Red Rooster IndieGoGo! Mark Pellegrini alongside Mitch and Elizabeth Breitweiser have launched their IndieGoGo for their upcoming graphic novel, Red Rooster: Golden Age. Red Rooster is a southern gothic cape and cowls mystery described as “Rockwell meets Lovecraft.” It is set in the dust bowl era and features Frank Cooper as The Red Rooster. But Frank isn’t the first hero to be The Red Rooster. It’s a mantle that has been passed down from generation to generation. Each Red Rooster has had to fight mankind’s most ancient and terrible evils. And Frank Cooper has done so. In fact, he’s seen wild success in defeating his foes. He’s even gathered a number of other celebrated vigilante folk heroes as his allies. However, he will be faced with a brand new challenge. A cabal of his most notorious villains will team together in order to not only destroy him, but ruin the Red Rooster Legacy forever. $25 will get you a signed version of Red Rooster: Golden Age as well as a”Order of the Dawn” sticker. The graphic novel will be signed by the entire team. $40 gets you two signed Red Rooster: Golden Age books and two “Order of the Dawn” stickers. Both books will be signed by the entire team. $50 earns you a signed copy of Red Rooster: Golden Age, the “Order of the Dawn” sticker as well as a Red Rooster sketchbook. $100 gets you a signed copy of Red Rooster: Golden Age, the “Order of the Dawn” sticker, the Red Rooster sketchbook, and a Red Rooster head sketch which will be found inside the cover of the novel. $175 gets you ten signed copies of Red Rooster: Golden Age. $200 gets you two signed copies of Red Rooster: Golden Age, two “Order of the Dawn” stickers, two Red Rooster head sketches, a die-struck lapel pin, and your name included in the back of the book as a listed member of The Red Rooster Society: Order of the Dawn. You will also get exclusive access to the secret society. $500 gets you a signed copy of Red Rooster: Golden Age, the Order of the Dawn sticker, the Red Rooster sketchbook, a Red Rooster head sketch, the lapel pin, the inclusion into The Red Rooster Society: Order of the Dawn, and an original Red Rooster watercolor drawing on A4 Montblanc paper. There are only 25 of these available. $1000 gets you everything at the $500 level except instead of the watercolor drawing you get an original page of Red Rooster: Golden Age artwork as well as a print of the corresponding page signed by Elizabeth Breitweiser. You will also get a signed page of script from Mark Pellegrini. There are only 40 of these available. $2000 gets your likeness included into Red Rooster: Golden Age and there’s a hint your likeness might even get a fiery death. There are only 4 of these available. $3000 allows you to book the entire Red Rooster creative team for a convention, store signing, or even a luxury yacht party. It does not include airfare and lodging. You will also get the die-struck lapel pin, and your name included in the back of the book. There are 2 of these available. $5000 allows you to include a full page advertisement in the back of Red Rooster: Golden Age that will feature artwork by Mitch Breitweiser, colors by Elizabeth Breitweiser, and copy by Mark Pellegrini. However, the team can refuse certain ad requests. There are 3 of these available. 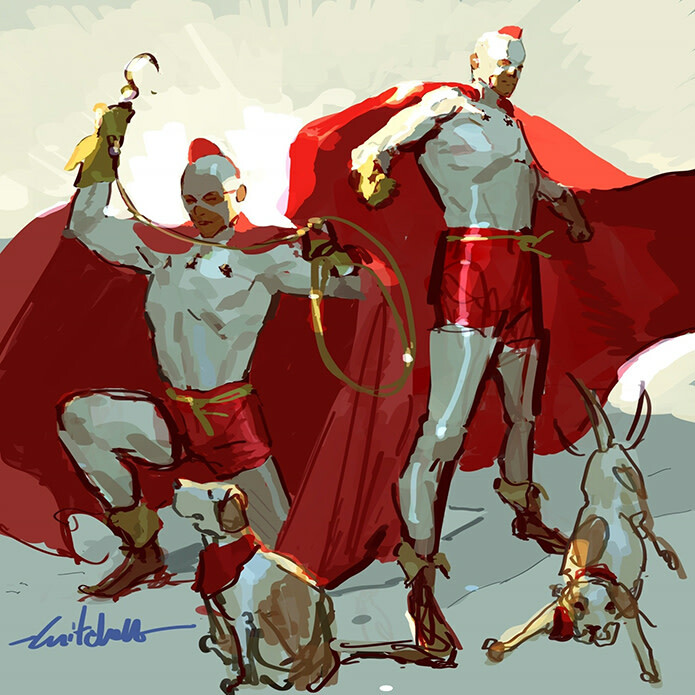 The Red Rooster: Golden Age IndieGoGo also features two stretch goals. The first stretch goal has been revealed. At $60,000 earned Red Rooster: Golden Age will be extended to 60 pages in length from 48. The second stretch goal is still a mystery but will be unlocked at $90,000. As of this publication Red Rooster: Golden Age has earned $24,345 from an original goal of $15,000. Nearly 400 people have backed the project. Comicsgate: Setting the Record Straight After Media Blitz Attacks the Popular Movement!